Hello people. First of all, even though this is the 1st of April, don't expect to find jokes here. I've been working on a remake of the site since the beginning of the year... The whole site has been completely recoded in PHP, CSS and SQL. Even though they most likely won't read this, thanks to Bebert and Seb who helped me out with all this! To start the new year right, Steve Snake has released a new version of Fusion (excellent 8 and 16-bit Sega consoles emulator) yesterday... Among the new features, Fusion is starting to support netplay! The Super Mario Kart hack I'm working on with Ok Impala! gets a new title, and becomes Epic Racers - Impala Kart Courses. The section dedicated to the game has been updated with screenshots and some info. See the thread on the forum for more details. Those who followed the news know it: Samurai Shodown VI (Samurai Spirits Tenkaichi Kenkakuden in Japan) got released yesterday at the arcades. I just dumped my previous news sytem for a new one. This one is much more convenient for me, and gives new possibilities... You can now comment any news if you are registered on the board ! Good stuff. By the way, the Samurai Shodown VI site got updated with two new sections, the 4th one of the menu containing screenshots of the game... Cool. Merger with Don Miguel's forums! This is official: my message board Don Miguel's become one. Actually, my board isn't moving, and Don Miguel's forums get added to mines. Therefore, you can expect more activity and support on the RPG Maker side! For more info, see this topic. Let's talk about RPG Maker for a change - of the XP version to be more precise (the latest to date). It has been recently announced that RPG Maker XP will get released out of Japan, and will be downloadable from download.com on September the 16th 2005. Been a long time people have been waiting for something like that... Even though the Japanese version has been released a while ago, it's still nice to see Enterbrain finally ended up acknowledging the Occidental market. By the way, it's a bit ironic how Enterbrain adopted the term "Maker" in "RPG Maker XP", this one originally coming from pirate English translations (RPG Maker is called "RPG Tsukuru", ie "RPG School" in Japan). But the appellation "RPG Maker" being much more recognizable, I guess it's a good choice. First of all, it's been a few weks that the official site "only" shows 40 characters, whereas 42 slots used to be featured there, before all the characters were unveiled. I guess they just decided to make the 2 remaining characters hidden ones. The identity of those 2 characters is still unknown, but Kuroko (the referee) will surely be one of them, in my opinion. The other could be Hikkyaku (the guy who throws food and bombs in the 2 first Samurai Shodown, and who was a hidden character in Samurai Shodown on Game Boy), or a 5th boss, like Ankikou (the demon that possesses Gaoh in the 2 last episodes). Anyway, it's been confirmed that Yuki is working on this game after all, despite the fact Yuki isn't mentionnd anywhere on the offical site of the game. Indeed, Yuki employees have been spotted ever since the first loke test of the game, to monitor and take notes about what was happening (thanks to Iggy for the info!). This is to my mind a very good news, which boosts my expectations for this game and reassures me as for potential unbalance problems due to the big amount of characters as well as to the 6 new selectable modes ("spirits"). By the way, I forgot to talk about the 6 spirits until now, but to sum things up, each of these 6 modes allows you to adopt a play style similar to the ones of the previous Samurai Shodown (so from 1 to 6, the 6th one being obviously a brand new mode). 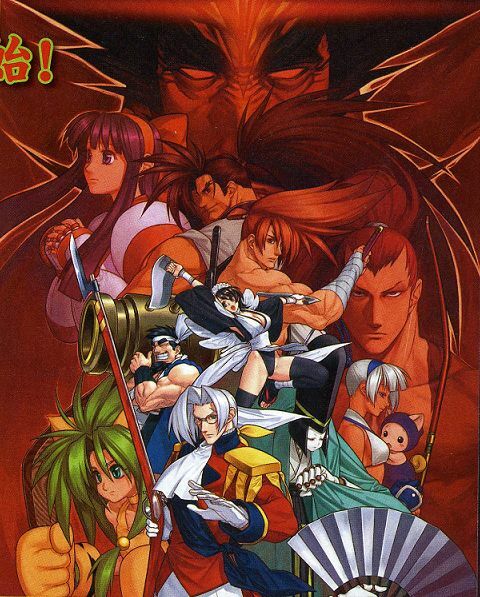 However, it seems that there will be no blood at all in the game, for the first time in a Samurai Shodown... Decision probably taken for the same reason as the one that got the last Samurai Shodown on Neo·Geo AES to be censored. To finish, the game was supposed to come out in the arcades at the end of this month, but its release has been pushed back to September. The official site of the game (in Japanese) has been updated today, and there you can see the list of the characters of the game... However, only 6 characters are visible for now, out of a total of 42 (!)... An impressive number, never reached in a fighting game until now, apart from a few crossovers, but not by a single series as far as I know. The identity of 36 of the 42 characters has already been confirmed for some time thanks to the loke tests... To sum things up, the game will have all the characters of Samurai Shodown V Special, Sankuro and Yumeji of Samurai Shodown V, 3 new characters and 3 come backs (Wan-Fu, Nicotine and Gen-An). Thus there are still 6 characters to be unveiled, and among them, we can expect to see the only 4 other missing characters from the two first Samurai Shodown, that is to say Earthquake, Cham Cham, Sieger and Kuroko. Anyway, the site of the game will be updated every thursday (as usual with Playmore), and I assume they'll keep adding 6 characters to the list each time... which would mean we'd know the full roster in 6 weeks at the latest.